Beautifies concrete surfaces such as patios, walkways, driveways, interior floors, and pool decks. Residential and commercial concrete stain applications for both new and existing concrete surfaces. 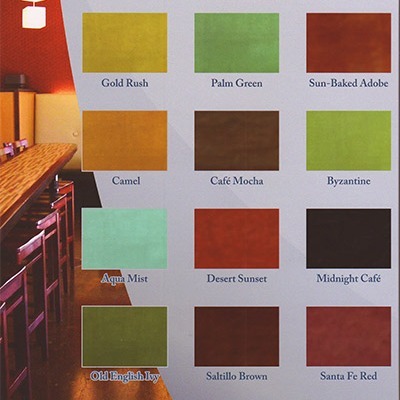 Premium quality stains in a wide selection of color choices with limitless design possibilities. Expert workmanship and affordable pricing. Almost no down time. Walk on your floor the same day we apply coatings. One of the great attributes of concrete stains is that you can achieve many different looks simply by using different application techniques. We can give your floor a mottled, variegation, layered, faux, leather, or a consistent glossy look. We are Albuquerque's concrete staining professionals. It's very economical. Call us today for a free estimate. Click the links below to see different color charts. We use the highest quality true concrete acid stains on the market. Concrete acid stains reacts chemically with the concrete surface and will produce variegated, translucent color tones. Concrete acid stain contains metallic salts that react with the concrete's lime content. Once the chemical reaction takes place you end up with a beautiful marbling effect which is permanent and won't chip off or peel away. The beautiful color tones produced with concrete acid stain blend well with Albuquerque's southwest architectural style. Straightline Painting will use a UV stable concrete stain product for exterior spaces. There are many design options so our customers get all the latest product bulletins and color charts. We can make stencils and overlays for custom finishes. Some of the benefits of using concrete stain on your next project for your Albuquerque home or business are the products we use are duarble, eco friendly and will reduce allergens. When we complete our concrete stained flooring projects in Albuquerque our customers are sure to receive proper care and maintenance manuals for the protection of your newly stained concrete floor.